In September,2000, Mary and I set off for a long weekend in the Lake District. We had booked our seats on the Orient Express,so the long journey would be,I knew, an enjoyable experience. We were in a select private 'cabin' at the front of Lucille(all the carriages have names)and even had our own door! Internal furnishings in every carriage are distinctive and luxurious - the marquetry designs in ours were in green dyed holly wood. During the journey we were able to visit all the other carriages & admire the different designs - leaping stags,inlaid bouquets,shells,landscapes, Art Deco patterns,shells&dancing ladies, all in different coloured woods. Every carriage had its own distinctive fabric designs & colour scheme. At both ends of each carriage was a washroom - Lucille's boasted beautiful mosaic floors,one with a naked lady and zebra; the other lady embraced a leopard. The journey passed pleasantly, with plenty of free champagne and orange- juice,an excellent four-course meal,afternoon tea and changing scenery. We had booked in at the Wordsworth Hotel, which is centrally placed in Grasmere and has a reputation for excellent cuisine. Grasmere, according to Wordsworth, is 'the fairest place on earth': it is at the head of a beautiful lake,surrounded and protected by great green hills,and has the peace and serenity of a small village set apart from the world. Before dinner we visited the world-famous Gingerbread shop,once the village schoolroom( William,Mary and Dorothy Wordsworth all taught there); it was only 200 yards from our hotel. Grasmere gingerbread is nothing like the soft,sticky English variety: it is flat,hard & covered in a crunchy 'secret' coating. The specially guarded recipe was the property of a certain Sarah Nelson, who in the 1850s took in washing and worked in the kitchens of Dale Lodge. Her mistress, Lady Farquhar,greatly enjoyed Sarah's gingerbread & encouraged her to make it for sale. At that time the schoolhouse,owned by the Church,became vacant as a three-bedroomed cottage,& Sarah and her husband Wilfred took it. Sarah would put her gingerbread in a tin tray for sale,& rest it on a tree-stump outside the cottage; she put up a sign. 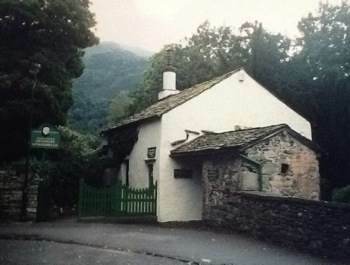 In the National Census of 1871 Sarah Nelson is described as 'Baker and Confectioner of Church Cottage,Grasmere',& soon after she sold the gingerbread in vegetable parchment. After she died at 88, her two great-nieces took over,eventually selling the recipe to the Wilson family,who hold the secret today. Tourists flock to the little shop,and the delicious,sweet smell begins to fill the air when baking begins in the early morning.